Navigation courses - longitude and latitude & nautical miles - RYA and ASA sailing schools. The earth can be regarded as a spherical object, and since we're dealing with a 3-dimensional shape we need coordinates of a different form than the usual x- and y-axes. Though adding an extra z-axes would make sense for submarines, we will most likely be found on the surface of this sphere while using another system of coordinates, that covers our planet with imaginary lines called meridians and parallels, see figure 1. All these lines together provide the grid which enables us to describe any position in longitudes and latitudes. 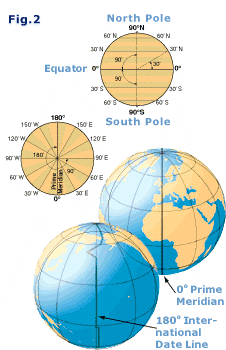 The obvious place to divide the Northern and Southern Hemispheres was the equator. But the division of the Eastern and Western hemispheres was the source of much political turmoil. Greenwich (Great Britain) won, placing for example The Netherlands in the Eastern and Ireland in the Western Hemisphere. It takes the earth 24 hours for a full rotation of 360°. Thus, every hour we rotate 15° longitude, see figure 2. When it is 12:00 UTC (international standard time) - anywhere in the world - it is 12:00 Local Time in Greenwich and 24:00 Local Time at the other side of the planet: 180° E or 180° W: the date line. Crossing this special meridian changes not only the hour but also the date. 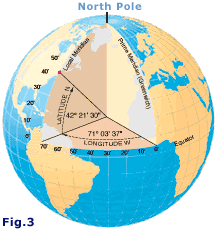 The North Pole has a latitude of 90° N and the South Pole 90° S. The meridians cover twice this angle up to 180° W or E.
Meridians converge at the poles, whereas parallels run parallel to each other and never meet. All meridians and the equator - the biggest parallel - form great circles, and the remaining parallels form so-called small circles. A great circle divides the earth in two exact halves. On small scaled charts we want to be accurate within one minute or one nautical mile. On larger scaled charts the accuracy is more likely to be within a tenth of a mile (a cable). If the earth were a perfect sphere with a circumference of roughly 40000 kilometres all great circles - meridians plus the equator - would have the same length and could be used as a distance unit when divided into 360 degrees, or 360° x 60' = 21600' minutes. In 1929, the international community agreed on the definition of 1 international nautical mile as 1852 metres, which is roughly the average length of one minute of latitude i.e. one minute of arc along a line of longitude (a meridian). We are now able to describe any position in latitudes and longitudes. Moreover, we can state the distance between two of those positions using nautical miles or minutes. All we need now is a proper way to define speed. For that, sailors use knots, the number of nautical miles an hour. And the most enjoyable way to learn how to sail is by combining such courses with a yachting vacation in Greece or Turkey. Ideal areas for sailing courses are the Saronic Gulf near Athens and the Ionian Islands to the west of Greece, which provide reliable and gentle winds, dolphins and ancient Greek monuments and temples. Mariners during the 15th century relied on charts called "portolans" to assist them on their voyages. Portolan comes from the Italian word portolani , which were medieval pilot books. The portolans contained maps of coastlines, locations of harbours, river mouths, and man-made features visible from the sea. They were a compilation of centuries of seafarer observations. As sailors' skills improved and the use of the compass was more widespread, portolans improved in accuracy. Also Columbus used these portolans on his journeys. Portuguese chart makers added the meridian line, a point useful for latitude sailing as well as for navigating solely by compass. A geographic feature could now be located through the use of its distance in degrees of latitude from a ship's point of departure. Note that the use of latitude and longitude was understood since the time of Ptolemy , the second century CE. During the fifteenth century Portugal led the European world in sea exploration. The golden age of discovery for Portugal lasted almost a century until the Dutch eventually seized their trade routes from them. As we move to the next chapter of this course we enter the sixteenth century when the Mercator chart was invented. Parallels: Circles parallel to the equator, ranging from 0° to 90° N or S. Only the equator is a great circle. 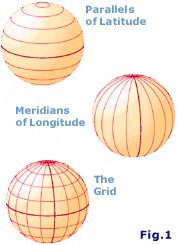 Meridians: half-circles converging at the poles, ranging from 0° to 180° E or W. Each pair of opposing meridians forms a great circle. Prime meridian: 0° or the Greenwich meridian which - together with the date line meridian - divides the Western and Eastern hemispheres. Great circle: The intersection of a sphere and a plane that passes through the sphere's centre. Small circle: The intersection of a sphere and a plane that doesn't pass though the sphere's centre. Time zones: By convention 24 zones, each 15° longitude wide. Hence, noon at Greenwich gives midnight at 180° E.
GMT, UTC, Zulu: The outdated accronym GMT (Greenwich Mean Time) is roughly the same as UTC or Zulu, and is also the local time at Greenwich when daylight saving isn't used. Note that UTC is an atomic time scale which only approximates GMT, so best to use the modern term “UTC”. Antonym: Local time elsewhere. For example, local time in Athens = UTC + 2. Date line: The 180° meridian which extends from or is opposite to the prime meridian. Here, not only the hour changes when crossing the meridian, but also the date. Latitude: Position property defined by the number of degrees north or south of the equator, varies from 0° to 90°. Longitude: Position property defined by the number of degrees east or west of the prime meridian, varies from 0° to 180°. Position: Latitude first and longitude second. For example: Athens in Greece 37° 58' N , 23° 43' E.
Nautical mile: One nm is one minute (') on the vertical scale on the chart. 1' equals 1852 metres. Nautical miles are divided into 10 cables. Knots: Nautical miles per hour.